Convenient pump! 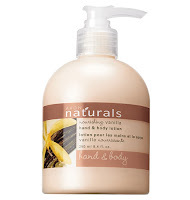 Softens and soothes dry skin, leaving it lightly scented. Formulated with BioSeed Complex and pure vanilla and soy extracts, this nourishing hand and body lotion moisturizes skin, leaving it pampered and enriched. Smooth generously all over body whenever needed. 8.4 fl. oz.